Specifically formatted using powerful hypnotic techniques to remove the fear of public speaking permanently. This program will help override the fear of and replace it with a more positive association next time you have to speak in public. It gives you the power to emotionally process alternative ways of dealing with the fear in a way that is suitable for you. This CD is also particularly useful if you feel that you always 'hold back' what you really think when talking with other people. It will allow you to gain the confidence to speak your mind more freely and uninhibited. So if you have an important business meeting, school oral or group function that you have to speak at and are scared, then this powerful self hypnosis program will most certainly help you conquer the fear and become a confident and dynamic speaker naturally. Hypnotherapy has been an amazing tool of transformation for me personally. I first began having private hypnotherapy sessions several years ago. I was so impressed with my progress that I began to study it . I now realise that it is the only way to reach the deepest recesses of the mind. We are all hypnotised by our environment daily. We are deeply influenced by everything we see and especially by what we hear, whether we are aware of it or not. Hypnosis helps me to remove the negative stuff and replace it with positive stuff of my choice. By playing the CD’s daily I am able to reprogram myself at my own pace. This is also a very cost effective way of daily therapy. I play them last thing at night and I wake up early in the morning to turn it on again. I sleep through it mostly and my sleep has greatly improved as well. 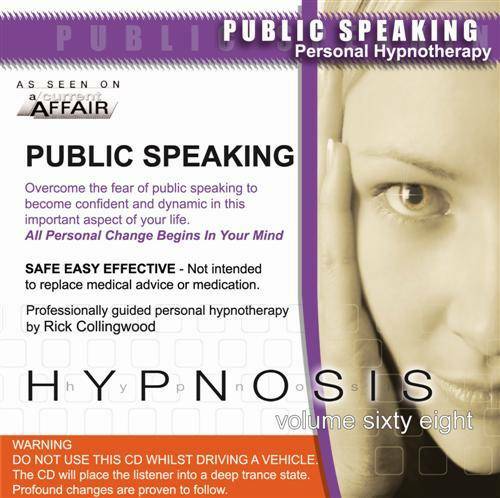 I had already had excellent results from using Rick Collingwood’s Hypnosis CD’s, when I rang the company to ask for a CD on public speaking. It just so happened Rick was in the process of creating a new CD on that subject. I am a writer about to publish my first book, so I needed the skills to be able to speak in public. Throughout my whole life I had always avoided speaking before a group of people. I would get panic attacks and become quite ill at the mere thought of it. Upon receiving the new Public Speaking CD I played it immediately. After only two days and three listening sessions I attended my first Toastmasters (public speaking group). I was amazed at the confidence I had. There was no sign of any nervousness or self consciousness. I volunteered to get up and speak in front of the group and felt perfectly comfortable. I will continue to play the CD as instructed for a month, twice daily followed by regular top-ups. Thank you for creating this life changing material. Now for my expreience and you can use it as a testimonial if you wish. I was asked to give a talk and demonstration. If you want to get ahead you cannot decline when opportunity comes knocking. So I accpeted the honour with gratitude. Immediately I started having panic attacks and dreaded visions of what would happen that evening. I imagined myself freezing, getting tongue tied etc. Once when I was 17, I had to recite a poem in a competition. I froze and ran out of the room when my turn came. It has stayed with me. It was horrible. Nonetheless, I set about preparing the talk and Power Point presentation in great detail. I did a lot of research and was comfortable that that side of it was of interest to the audience and well researched. The panic attacks just kept on. I couldn't sleep at night. So I thought I would try, with some skepticism, some on-line self-hypnosis. To my astonishment there is a whole world of it out there. I spent days researching. I thought I would try 2 different ones. Rick's was an abolute standout even thought the other one came highly recommended. Here is what happened. I downloaded the mp3 and got to work The first time I played it ( a week before my talk) I knew I was on the right track. There is great depth and skill in Rick's Public Speaking CD/mp3. Through all the terror attacks and sweaty palms and huge self-doubt I just kept on every day playing it. The day before my talk I played it twice! On the day I played it again. The words are wonderful. I was still panicky when I left to give the talk and did a meditation in the car before I went to the firing squad. Do you know what? Everything Rick said would happen happened to me that night. I am so proud of myself with what I achieved. A life of demons vanished. I confidently and happily made the presentation. I loved it. I engaged with the audience and it all went so well. I was congratulated many times over. I was told I was confident, at ease and gave a great informative talk. The sense of accomplishment is impossible to describe. I could hardly believe they were talking about me. In addition they paid me for it. I agreed to do it as I thought it would enhance my career. Money was never mentioned. I was overwhelmed. But wait there's more. The very next morning, I received a phone call with a request from another organization to deliver a talk to their group. I couldn't believe it. Someone who heard me speak passed the news of my talk on. The lady in question told me so. I accepted with great joy and am now looking forward to my next talk. I am not having panic attacks or tremors. Just really looking forward to the joy of delivering my well researched talk again. I thought it was a one-off. I am so thrilled I can share the information I worked so hard to put together with another audience. This time I am going in with confidence and looking forward to it. Just as Rick said would happen in the mp3. I am still stunned . I will continue playing the mp3 for several more weeks. I am going to buy some more CDs as I know my daughter can benefit from them as well as me So a huge thank you for a brilliant work By the way, the second mp3 I downloaded was OK but NOTHING on Ricks and I won't use it again. I am so looking forwarded to the next phase of my life. There is so much out there to benefit from and and then to help others with".